This project is brought to you by a domino-effect of inspiration via instagram (which is my FAVORITE kind)! 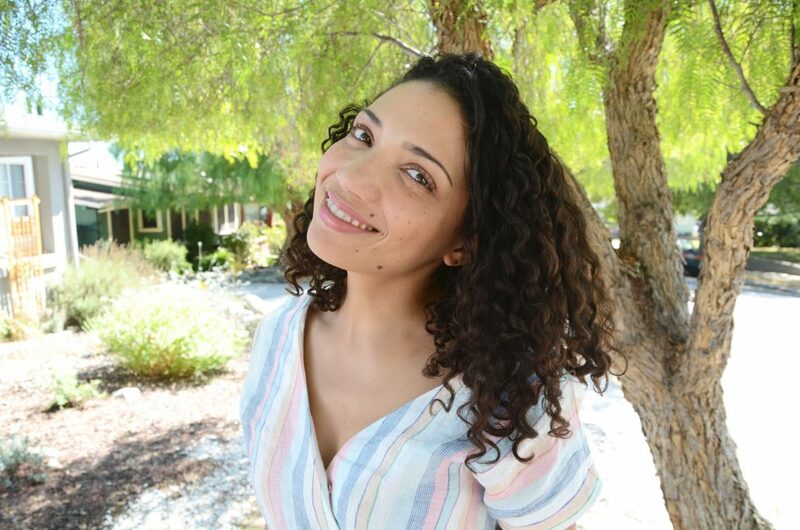 I initially saw Katie’s (of What Katie Sews) absolutely fantastic wrap jumpsuit that she posted about on her blog here and fell in love. I love the shape! I love the fabric! I love the design! Wrap jumpsuits aren’t really a big thing right now, but they should be- I have been on a jumpsuit kick the past couple of months that is unreal (you’ll see the fruits of that obsession here on the blog soon), so every time I see a new version of one I get super excited. I have never before seen a design quite like Katie’s jumpsuit, though, and according to her blog post she got her idea from a garment made by Threadsnips. Catherine sewed up a very cool vintage jumpsuit pattern that wrapped around the waist with ties and suggested that other sewist’s could recreate this design fairly easily by using a simple jumpsuit pattern and altering a couple of the lines of the pattern pieces, which is what Katie did to great success. Katie used a Butterick pattern she had in her stash for adapting hers, but I didn’t have anything in my arsenal that would work well for this hack so I took Catherine’s advice and just used the free In the Folds jumpsuit pattern from Peppermint Magazine. I am not gonna meticulously share all the details of what I did to adjust the pattern since both Katie and Catherine did the hard work of it already, WITH pictures (bless y’all! ), so check out their blog posts to get the very simple details of exactly how to hack the pattern. I will share the general details of what I did though! First I adjusted the shoulder seam of the jumpsuit pattern because I knew I wanted a kimono sleeve and not sleeveless, as the In the Folds jumpsuit is drafted. I basically moved the width of the dart of the front of the jumpsuit to change the angle of the shoulder seam so that it was raised higher, and I added several inches to the length of the seam to make it jut out from my arm. I drew in the pattern line for the rest of the sleeve (I basically just mimicked the line of Katie’s Butterick jumpsuit sleeve) and connected it to the side seam of the body of the jumpsuit, copying the same lines for the back piece. I adjusted the side seams of the jumpsuit pattern to make it a little closer fitting since some of the images I saw of the pattern in a google search seemed like it had an awful lot of ease in the waist and hip area. After sewing up a muslin in some old bedsheets and improperly adjusting the length (I overestimated how much shorter the jumpsuit should be in the bodice and ended up making it WAY too short, so I added all but about a quarter inch of the length back when I moved on to my fashion fabric), I used a gorgeous cut of linen from The Fabric Store for my wearable garment. I have been SO into stripes lately (particularly stripe play!) 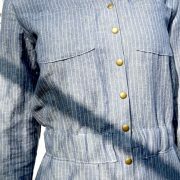 and thankfully TFS has stocked a ton of really beautiful pieces to choose from. Plus, Los Angeles weather means I can get away with wearing this wonderfully breezy fabric for quite a while longer. Initially I wanted to play around with the direction of the stripes (like one half of the jumpsuit in horizontal and the other in vertical), but my yardage wasn’t quite wide enough to accomodate proper pattern placement, so I stuck with the vertical stripes all the way around the garment and I’m actually really happy it turned out this way. The stripes of this yardage are already pretty dynamic, so adding even more drama to it might have put it into clown territory? I mean, I still love the idea of the directional stripes for a jumpsuit like this, but maybe if the stripes are all one color/size/pattern it will have a more subdued overall look. I’m sure my original vision is still somewhere in my future! Anyways, after I sewed up my linen, I drafted facings for 1. the front neckline all the way down through the added triangular piece of the wrap to the crotch seam, 2. the back neckline, and 3. the sleeves. My original plan was to just use bias binding for the edges but I didn’t have very much striped fabric leftover and I also realized I should have something a bit more stable for the neckline since it is such a long seam line (also, after sewing this garment up, I know that for next time I need to STAY STITCH THOSE FRONT NECKLINE EDGES, because that fabric stretched waaaay out in the process of sewing everything else up). I used some white scrap linen I had for the facings and I interfaced them all, sliding the ends of the ties between the fabric and facing on each triangular edge before edgestitching them closed. After drafting and sewing up the facings, the actual construction of the garment was SO FAST AND EASY. I left a hole opposite the edge of one side of my wrap for the waist tie to get pulled through, under stitched all my facings, I edgestitched the wrap onto the opposite pant leg a few inches past the crotch line to keep it closed. Since the front opens up to a wrap style, the back zipper is unnecessary, but it also means that the front wrap wants to splay open a bit, so I added a snap at front center to keep the wrap closed and I also added some bra strap snaps at the shoulder seams- I think there is a more technical term for this, but basically I created a loop inside the garment for the bra straps to be hooked onto which helps keep the shoulder seams in place. 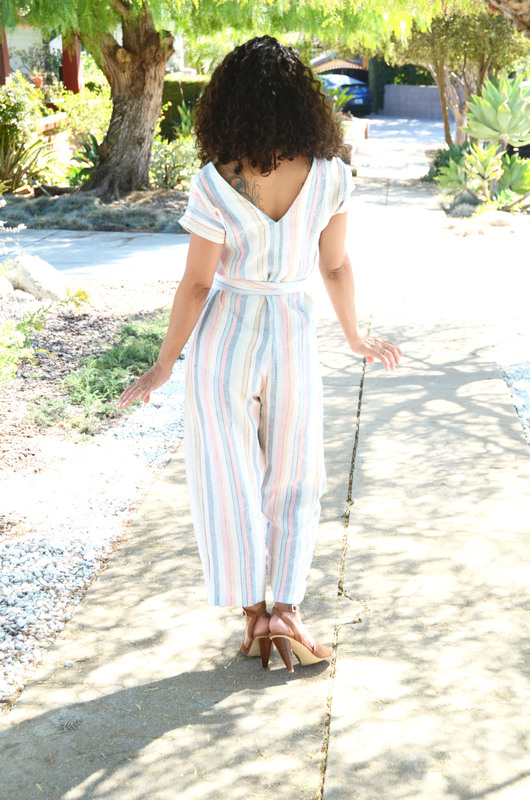 I am CRAZY about this jumpsuit: it’s comfortable, summery, fun, and I have never seen anything quite like it in a store before. I am dying to make it in a solid, slightly more supple fabric for the fall- maybe like a crepe rayon or even a printed satin-y silk. I might try to add some pockets to my next one, and I might also try and adjust the angle of the neckline so the garment won’t want to fall open as much (hopefully negating the need for the bra strap snaps!). And longer waist ties for more drama! But all in all, this make was exceptionally quick and satisfying to make, and it’s technically not summer anymore but I should be able to get a few good wears out of this before the weather gets too cool. I am so very thankful for other sewists sharing their hacks, tips and makes with the community, (thanks, Katie and Catherine!) and thankful to Claire for taking these bright, pretty pictures! Gorgeous! Loving the stripes. Now I wanna t to try one of these. I’m 47 and hubby is 59 so the last time I made a jumpsuit he teased me about Tim warping to the 70s. Thankfully I got lots of support elsewhere. Lol. This idea is awesome though and I really want to give it a try. Thanks for sharing what you did with what others shared! So inspiring on so many levels. 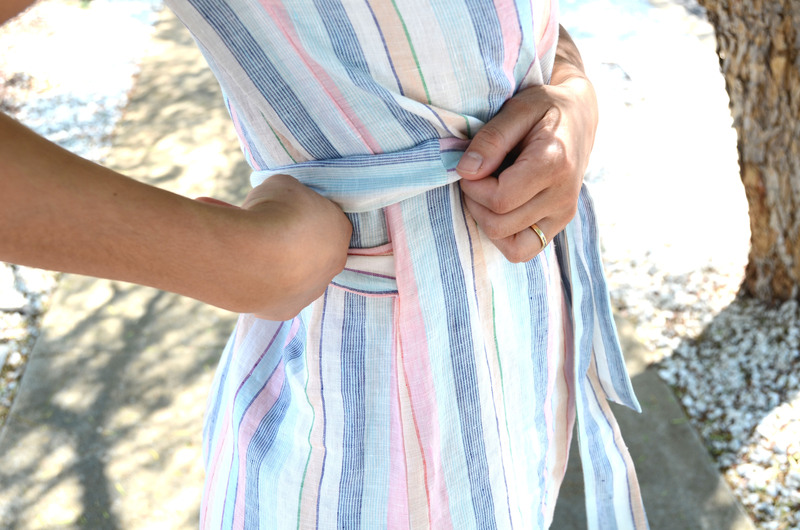 Keeping the stripes vertical for this kind of multi-colored, asymmetric stripe patern was a good choice. The horizontal stripes on the tie set everything off just right. But it would be really cool to see some stripe creativity with a more even stripe. I used to think I hated stripes, but I am really coming around to how creatively they can be employed when you are making garments with unusual seamlines & silhouettes. This jumpsuit turnd out really cute! I’ve done some fun stripe play with varying sizes of stripes in the past that never made it to this blog and feel confident that the vertical and horizontal stripe combo would have looked great on this jumpsuit, again, I nixed the idea out of fabric limitations more than anything else, although I am still happy with how this came out. It is gorgeous on you! Absolutely stunning! There’s going to be a fourth person jumping on that hacked wrap jumpsuit train for sure and that person is ME! It looks great, thank you for sharing! One question – when you drafted the facing, did you cut them on the same grain as the neckline/wrapline, or did you make very wide bias tape? Also, did you interface the facings? I didn’t make bias tape, I made interfaced facings for the neckline. The domino effect continues…! Inspired by Threadsnips and Katie and you, I also hacked the Peppermint jumpsuit pattern to make a wrap. It largely worked and I love it, but I did not manage to get the crotch to lie flat in the way that yours seems to… I bias bound the edges instead of drafting a facing, so I wonder if facings would solve this problem? Would really appreciate ideas! Facings would solve the problem, or fully lining the garment.